Wow! Did you guys realize that February 9th was Fat Tuesday (Mardi Gras), Pancake day, chocolate day, pizza pie day and national bagel day?! How does a girl decide what event to observe?! How about you? Did you do anything special on the 9th? Oh, wait… and we cannot forget sweet Cupid knocking on the door to this weekend too, huh? Whew! While I’ve never officially experienced Mardi Gras in New Orleans, I like to think of myself as slightly indoctrinated into the festival and of course the feast! Yes, my dear friend Mary, born and raised in New Orleans, and her family would celebrate and make a big shebang and invite us on over to partake. When I say shebang…. I’m talking full-scale! The glitz, glitter, beads, masks, Mardi Gras decor, and of course good ol’ N’awlins food! AH! Each year I looked forward to it! I could practically taste the King cake as the month of February approached each year. You know, looking back and reminiscing, I’m pretty sure she always made sure that I got the baby in my piece of cake too. Mmmmm such sweet memories to savor for a lifetime. Unfortunately my friend Mary and her family moved onto another country and I feel like it’s my duty to uphold the our little tradition, even if we cannot enjoy it together. Sooooo… deciding what we’d celebrate on February 9th wasn’t a big deal after all. Bring on that good ol’ N’awlins colorful feast! All of the recipes I used were passed onto me by Mary herself. You could practically hear the New Orleans jazz and brass bands in the background couldn’t you? Haha! I feel like we represented well and made her proud this year flying solo? Perhaps next year I’ll snag her King Cake recipe and give it a go and snag some beads for an even more festive feel. Here are some inspirational Mardi Gras recipes to tickle your fancy. Enjoy! Typically I brown bag it everyday at work, however a building mate asked me if I’d like to join him for lunch nearby at a friends restaurant. Although my peanut-butter, banana, topped off with local honey on whole wheat sounded very satisfying, lol, I said sure! 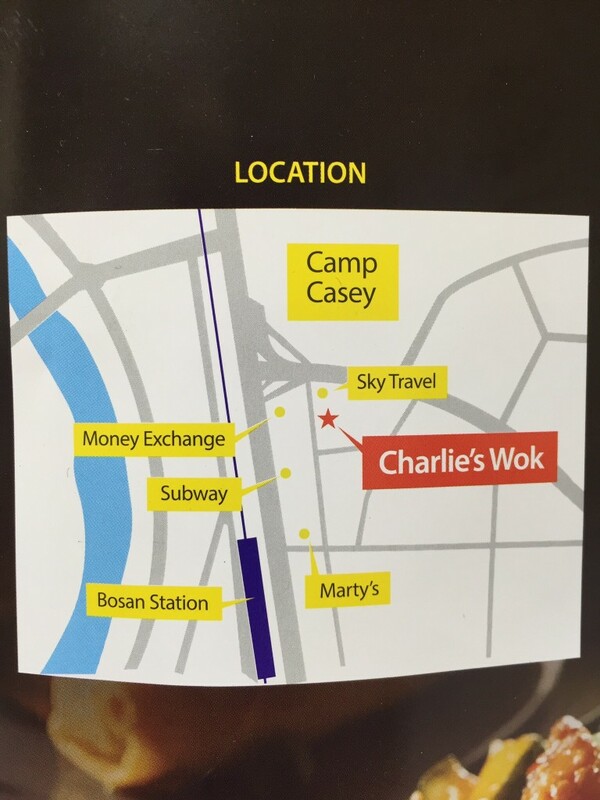 So we went to Charlie’s Wok, an American Chinese restaurant, where I was introduced the main man himself, Charlie. 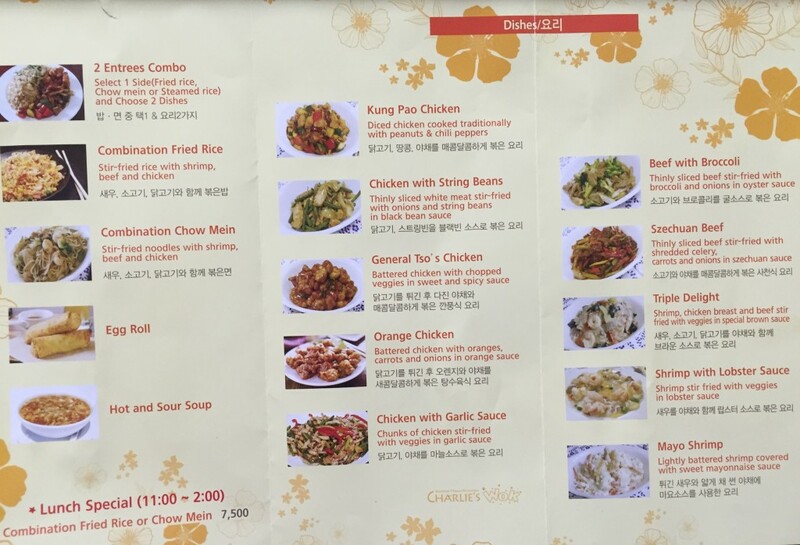 The restaurant is located off the Main Street and tucked away in an alley near the Bosan subway station and US Army installation Camp Casey. When we pulled up to park, I quickly realized why I had never seen the restaurant before, it was because of the discreet location. Don’t let the unassuming exterior and location fool you, once we stepped inside my nose immediately told my belly that I was in for a treat. I learned that the food is always freshly made after you order, so be prepared for a bit of wait. You do have the option to place a take out order, as well as call ahead to place your order to eat dine in. If Charlie isn’t available, the restaurant does not open, it is a one man wok show. You see the pride Charlie takes in his food quality, the prices are very reasonable and you are served generous portions. I ordered a 2 entrée combo meal because I couldn’t decide between the beef with broccoli, and General Tso’s chicken. With the combo you also decide if you’d like fried rice, or chow mien. I ordered chow mien based off of recommendation. The recommendation was spot on! Overall, I was pleasantly pleased with my order. The menu offers a small variety of standard Chinese American staple choices and price points. Sure, this isn’t a gourmet 5 star restaurant, but it definitely is a great little neighborhood find!